In spite of a pesky raccoon, Sarah and I had a good night sleep at Indiana Beach Camp Resort. After a quick breakfast we purchased our wristbands and rode the tram to Indiana Beach. Our first ride of the day was Steel Hawg. It was a new high-tech compact steel coaster by S&S Power. This black and orange thrill machine featured a 111 degree first drop, an off-camber turn, an inverted drop and a heartline roll. What a great ride. We couldn't get enough of it. Hoosier Hurricane was next on our list. This was a very unique wooden coaster, in that it was largely built over many other rides in the park It also plunges down near the water at several points. This out and back coaster traveled nearly the entire length of the boardwalk and had great airtime. A great ride. The other wooden coaster at Indiana Beach was Cornball Express. It was also built over other rides and dripped down to the water. However it had a circleing layout and featured a high-G helix. It was a good ride and quite a thrill. The steel coaster Tig'rr was built on top of a restaurant and picnic shelter. This compact ride offered unique inline seating, two high-G high banked turns, a couple quick drips, some helixes and a smooth ride. It was a good ride. Our final coaster of the day was Galaxi. This compact steel coaster is surrounded by waterslides. I was very excited to ride this coaster because it was an exact copy of Bavarian Beetle at Kings Island. Galaxi had two fantastic drops that created huge ejector airtime in the back row. Its two helixes seemed to go on forever. It was a great ride. Sarah and I rode this coaster more than any other in the park. Indiana Beach was a small park packed with rides and charm. It had many features that make me envision what parks may have been like in the 1950's, 60's and 70's. 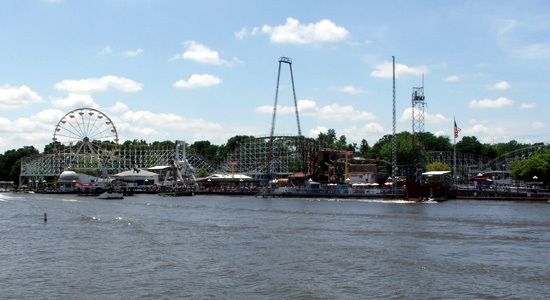 A boardwalk ran along Lake Shafer and several rides were built over the water. The park is wedged between the lake and the surrounding cottages, homes and resorts. If Buckeye Lake amusement park were still open today I would bet it would be very much like Indiana Beach is today. We had perfect weather with mostly sunny skies and a light breeze. At mid-afternoon Sarah and I ate at the Skyroom Restaurant overlooking Lake Shafer, the beach and the boardwalk. Throughout the day we rode a lot of the parks other rides including Air Crow, Antique Autos, Den of Lost Thieves, Dodg-em, Giant Gondola Wheel, Tilt-A-Whirl, Water Swings, Skyride, Paratrooper, Double Shot and Wabash Cannon Ball Express. Sarah took solo rides on Music Express, scamblers and Falling Star. We also took a cruise on the paddle wheeler Shafer Queen. This half hour trip took us along the shores of the lake, to Norway Dam and back. It was a relaxing time in the sun and a great opportunity for pictures. Sarah and I had a great time spending our entire day at Indiana Beach. Tomorrow... the long drive home.